Career Guides: Information regarding job opportunities, employment prospects and the associated educational requirements. Jobs and Wages (OES): These data from the Occupational Employment Statistics Survey report occupation and wage data by industry. License Lookup: Provides a listing of occupations with the associated Indiana licensing requirements. 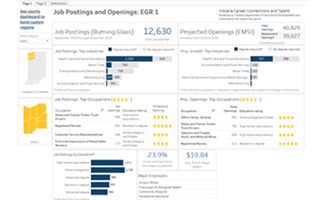 Occupational Projections: Estimates of current and projected industry employment for a 2-year (short-term) or 10-year (long-term) projections period from the Indiana Department of Workforce Development. Projected Jobs by Industry: Occupational staffing patterns from the Occupational Employment Statistics Survey organized by industry. 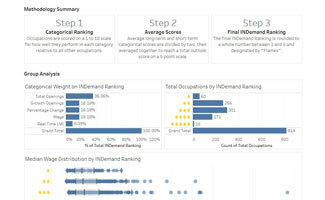 Real-Time Job Demand Reports: Regional highlights from the Help Wanted Online data set. Transition Time: Estimate the preparation time required to transition from one occupation to another.